View a map of this region. You can't beat the view from atop the highest point of the Escarpment. Tall trees stand guard between an endless expanse of water and sky. From beaches and bike trails to farmers' markets and lighthouses, breweries, vineyards, caves, cliffs, cafés and concerts. Enjoy fair rides or a ferry ride. Indulge in spas, shops or take in local art galleries. 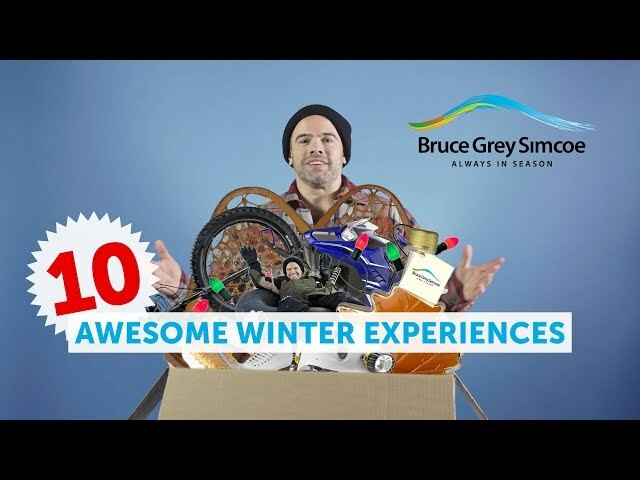 Get out and hike, bike, fish, climb, zip, paddle, spelunk, soak, sample, savour, wander, wonder and explore the astonishing slice of paradise that's waiting for you in BruceGreySimcoe. Visually stunning, Bruce is an epic place to play. The Bruce Trail follows the Niagara Escarpment along sparkling Georgian Bay. Join Kincardine’s Scottish Pipe Band Parade on Saturday nights, discover the Port Elgin, Southampton and Wiarton waterfronts, lively Sauble Beach or other beaches. “Colour it your way” in gorgeous Grey. Hike the Bruce Trail, with some of this awesome footpath’s best vistas. Here are Scandinave Spa Blue Mountain, and Blue Mountain Village. Simcoe County’s natural assets are just right for living and playing outside, with Lake Simcoe for fishing, boating and beaching. There are cycling trails galore here, scenic waterways and shorelines for paddling enthusiasts, lively Wasaga Beach and resorts with awesome family experiences. Celebrate this winter at fun festivals all ages can enjoy. BruceGreySimcoe is a beacher's paradise! From the beach towns of Wasaga Beach and Sauble Beach to the quieter beaches in Kincardine, Meaford, Collingwood, Orillia, Barrie and those in between, you'll find "just the right" spot for your "beachin' style".